Exploring the wilderness on skis., originally uploaded by BigAssSuperBlog. We took advantage of the nice weather on Saturday by taking a trip to Ski Martock, about 45 minutes away from Halifax outside of Windsor, Nova Scotia. 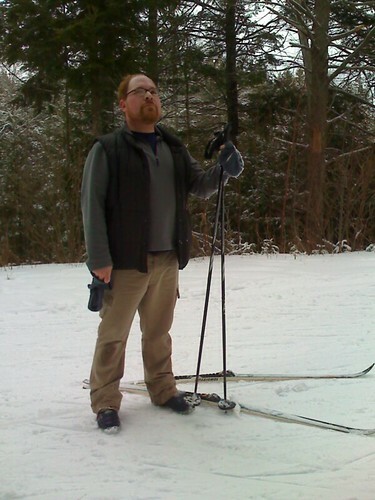 I haven't been cross-country skiing in ... well ... 25 years? I feel really old to be able to say I haven't done something in 25 years. That just feels so wrong. I skied (that doesn't look like it's spelled correctly) about as well as someone who hasn't skied in 25 years would, especially if he wasn't a good or even adequate or even passable skier 25 years ago. As you can see from the "Scott The Explorer" shot above, I had wet spots on my pants from several falls. As you might not be able to see from the shot above, I landed on my poles. I (mostly) straightened them out. Additional notes ... yes, my glasses are fogged up there ... skiing is hard work! ... The photos were taken with a Motorla Razr2 phone on loan from Rogers Wireless to be reviewed on an upcoming episode of Maritime Morning. If anyone has any cool tips for using this phone, lemme know, 'cuz for all I know, it's just a really skinny phone with a good camera on it ... And, I lost my mittens. I think I lost them when I was returning the skis or boots ... I almost lost my beloved Boognish (Ween) hat early on the ski trail, but another (athletic, skilled, polite) skier picked it up and returned it. That would've been the second Boognish hat I lost, having had one fall out of a car at the Avalon Mall in St. John's, Newfoundland early in the decade. Best pic ever, my dear. Loved the sleeping kitty, too. you look like you're having fun! glad you're making the best of the season. Keep warm!